Anyone who loves their pet would do just about anything to keep their pet happy and healthy for as long as possible. So, how do you know if your pet is in perfect health? Serious illness or disease isn’t always obvious, especially in the early stages, and unfortunately, our pets can’t tell us how they feel. How can you be sure your pet is healthy? The answer is a combination of annual physical examinations and diagnostic testing. Diagnostic testing can provide you with a clear picture of your pets overall health by identifying medical issues in the early stages so that your pet can be diagnosed and treated properly. There are many conditions that - if diagnosed early enough - can be completely reversed or controlled for extended periods of time. In addition, assuming that all the tests are normal, it can provide your veterinarian with baseline date for future healthcare needs. Greenbrier Veterinary Services is able to offer some of the best in diagnostic imaging and in-house laboratory equipment. Most illnesses can be diagnosed by our staff rather than needing to wait on a third party. Our hope is that having these tools on hand will create an extraordinarily convenient and stress-reducing environment for both owners and pets. Explore further to learn more about our equipment and capabilities. 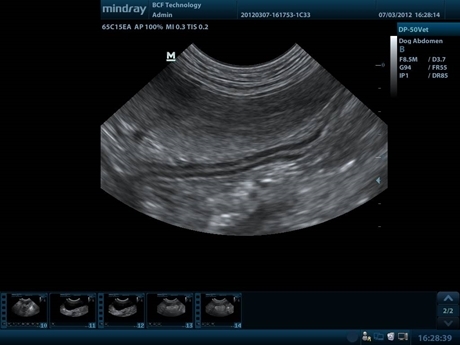 Ultrasound images of a dog's abdomen. Radiograph of a dog's chest.